I like to incorporate some goofy pieces of wood into my work. Many of them have structural issues or voids that need to be addressed before they can be used in a project. 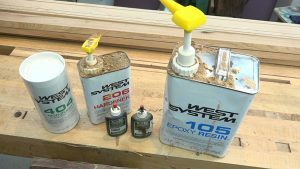 Epoxy works great for filling and stabilizing knots, cracks, voids, and other defects in wood. Hi Matt, love your videos! I am building a media center from hickory and want to use some “character” boards for door panels, one of which has a knot that is just perfect in size and placement, however, it has a void that is rather large. My question is: do I fill with west system expoxy before I run through thicknes planer of after? Thanks in advance, and looking forward to your future posts! Whenever possible, I fill before dimensioning. The epoxy will support the fibers as they are being planed so you wont get any tear or chip out and the epoxy will be all cleaned up once surfaced. thanks! Planning a cherry wood project and will be using your methods to fill checks and cracks in the lumber. My plan was to finish the project with Waterlox original finish. How do you think this will work over the epoxy repairs? Waterlox shouldn’t have an issue adhering to the epoxy. Matt, great post. I tried this and it worked very well. I’m a total amateur too. One question: sanding dulled the epoxy quite a bit. Will my top coat (varathane take care of that or something else needed to make it shine a bit more? The top coat will bring back a lot of the sheen but if you’re using a clear fill that you want to not look cloudy, you’d need to polish the epoxy to a minimum of 1000 grit. Thanks! Hi, I recently got a large piece of wood that I am going to use as a vanity top. I am wondering if you have ever used glass beads or objects in large voids before the epoxy as a decorative look and does anything different need to be done? I haven’t as it’s not a look that I particularly like but nothing needs to be done differently. The only thing to concern yourself with is keeping the objects submerged if they would have a tendency to float. Cherry counter top boards do not all “fit” tightly together – Epoxy would be the right path to fill those gaps? First timer with building counter tops and barley have an idea of what i am doing…lol. Thanks for your time! can a cured epoxy void on an edge be routered and cut on table saw? question: have you ever filled a crack with epoxy after you have installed a butterfly? if so, did you like the look, or did it detract from the logic of even having a butterfly? If I’m going to do that, I’ll fill with epoxy first and then install the butterfly. This keeps the epoxy from ghosting into the grain of the butterfly which keeps it looking crisp. The overall look depends on the application but I like having the cracks filled and stabilized with epoxy and adding butterflies just for show. Hi Matt! Timy Mac, The Maker Apprentice hereI Never used epoxy so I need some guidance. I’m using 100+ year old oak barn wood for two end table tops. They have a few voids, pest damage, ect., but nothing that goes all the way through the stock. Should I rough cut to finished size and then epoxy the voids or go ahead and fill the voids and then rough cut. I’m having to decide where to cut the boards out of the stock so I don’t have to use so much epoxy. Make sense? It’s much easier to fill first and accept some epoxy waste but if you are concerned about it, cut everything to final size and then do your filling. What tint colors would you use for alder? The table will be finished with Rubio monocoat chocolate. What trans tint color do you use for black walnut? Matt, I have a 60″ long live edge walnut slab. It’s a 7/4 thick piece and there is an 18″ long crack, 5/32″ wide starting at one cut end. The 2 adjacent surfaces are about 3/32″ out of plane at the cut edge across the crack, but otherwise the slab is very flat. I’m thinking of temporarily clamping a straight edge across to remove the slight twist and then filling the crack with epoxy. Do you the epoxy will resist the twist and hold? Or do I just fill as is and re-surface.? The epoxy will hold but you might have a bit of spring back. I’d try the holding it flat thing and just resurface after the epoxy sets if necessary. You can go pretty far with it and fill all the defects to end up with structurally sound material. I look at it as more of an aesthetic decision. Thanks so much for your video on filling cracks I used the West System like you used in your video on a table that has a veneer top. I over filled slots and dents that were part of the original design. I thought it would be easy to come back and sand the excess off but what is happening I am sanding through the veneer and taking off more wood than I want. Would a hand power planer work better? I don’t want to take any more wood off. I really appreciate your videos, they are very well done and helpful and it is making me (who knows nothing about wood work) want to really get into it as a hobby in retirement. Matt, will this stop rot? I have a piece that was rotting inside. Was thinking of filling it to stop the rot. Do you have to completely clean out the knot before filling it? No, the epoxy is thin enough to penetrate and encapsulate any dirt or debris.